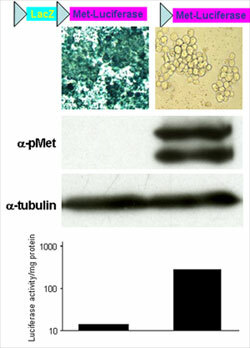 In cancer, aberrant signalling by the RTK Met recapitulates all the biological events controlled by Met during embryogenesis. In particular, unstrained Met triggers the molecular and biological processes underlining tumour growth, protection from apoptosis, cell dissemination and resistance to chemotherapies. 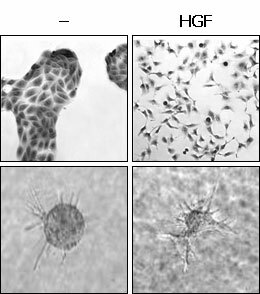 For example, Met over-expressing cells acquire invasive phenotype during progression of breast cancer, and autocrine activation by HGF is responsible for spontaneous metastasis to the lung. Mutations or amplifications of Met have been found in different types of human cancer cells and Met is a prognostic marker for different carcinomas. Recent studies on cancer resistance to molecular therapy have demonstrated that lung cancer cells develop resistance to EGFR inhibitors by recruiting Met to activate HER3 and the PI3K-Akt cell survival pathway. Altogether, these results make evident the clinical impact of new molecular therapies for cancers where oncogenic Met is the primary cause or where it confers drug resistance. Over the last two years, in collaboration with the lab of Prof. J.L. Kraus at the IBDML, we have identified a new chemical compound that selectively blocks Met activity and biological responses. Further work devoted to Met drug discovery let us to uncover novel chemical and physical properties of effective synthetic Met inhibitors. We are examining their ability to block Met-triggered biological responses and activation of downstream targets. Their therapeutic potential will be evaluated by performing pre-clinical trials using our engineered mouse model for cancer drug development. These transgenic mice over-express Met in a temporally and spatially regulated manner. Met-overexpressing cells will also express the Luciferase reporter gene to allow non-invasive monitoring of primary tumours and metastasis in vivo.